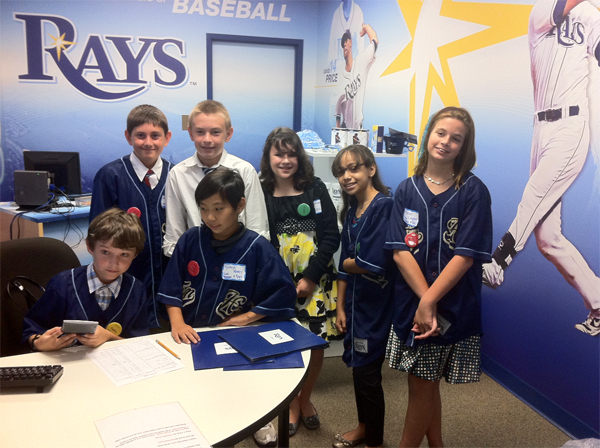 Fifth grade Students from Bevis Elementary learn how to run a business from start to finish at their day at JA BizTown. How many 10 year-olds do you know that can create a profit and loss statement and create a business with a balanced budget? At the Junior Achievement BizTown village in Tampa, every Hillsborough County fifth grade student gets this chance plus more at their field trip to BizTown. Students enter BizTown with a previously determined job assignment that they have personally applied for and work a business for the day from start to finish. From TECO, Busch Gardens/AAA, Tampa Bay Lightning and Devil Rays to McDonald’s and CVS and Publix, the students use a four-week curriculum, completed in class to work a business. Upon entering the full-day field trip, students report to their job assignments within the BizTown village which is a 15,000 sq. ft. town with small, mock version businesses with bright and colorful logos and marketing and more than 20 top corporations represented. After settling into to their assigned jobs, whether it is CFO, writing paychecks or the CEO signing the checks, the students must determine a budget for their business and make a plan to make their business profitable. JA BizTown is an indoor center that contains a mini city with up to 18 public and private businesses. Each business within the center is sponsored by a real local business and displays the authentic logo and the actual marketplace appearance of the sponsor bringing the town to life for the students. Before visiting JA BizTown, students complete a pre-visit curriculum program where they learn basic economic principles such as how to manage their personal bank account. They also participate in job interviews, learn about their new workplace and the job they will perform. Jobs range from retail sales professionals, accountants, business managers, medical professionals to TV and newspaper reporters. There is even a mayor! The Bill Poe Family Junior Achievement Center in Tampa houses a world-class learning facility where fifth grade students explore the world of business in a mini-city consisting of public and private enterprises. The village has an annual capacity of 14,000 students and features a state-of-the-art training facility for educators and volunteers. JA BizTown, a partnership between Junior Achievement and the Hillsborough County Public Schools, operates through the generosity of volunteers and teachers and depends solely on financial donations from individuals, businesses and foundations. JA BizTown is located at 13707 N. 22nd St. Tampa. For more information, visit 631-1410 or visit www.jahillsborough.org.